In 1776, right around the time a certain Mr. Washington was taking the oath of office to become America’s first president, across the ocean in Japan the artist Toriyama Sekien (1712-1788) was hard at work on a first of a very different kind: creating the first encyclopedias of yokai, bizarre monsters from Japanese folklore and history. Starting with the 1776 Gazu Hyakki Yagyo (The Illustrated Demon’s Night Parade) and ending with the 1784 Hyakki Tsurezure Bukuro (A Horde of Haunted Housewares), these four volumes contain some of the oddest imagery and commentary to come out of Japan — or anywhere else. 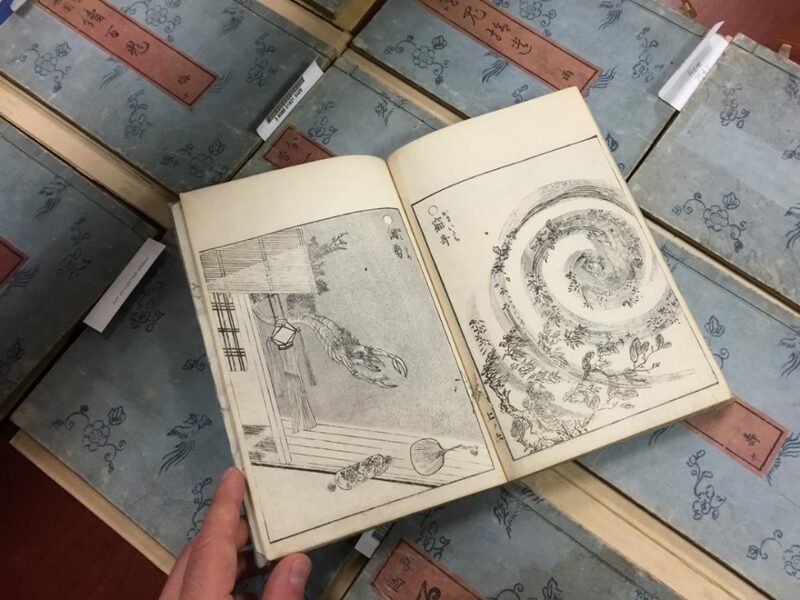 The Smithsonian Libraries Sekien volumes, held in the Freer Gallery of Art and Arthur M. Sackler Gallery Library. The yokai are a constant presence in Japanese literature and myth. In a nation said to be home to some eight million gods ranging from mighty deities on high all the way down to a god of the toilet, yokai represent an integral part of this ethereal spectrum. They are said dwell all around us, staying out of sight save for when they want to pop out and give us a good scare. 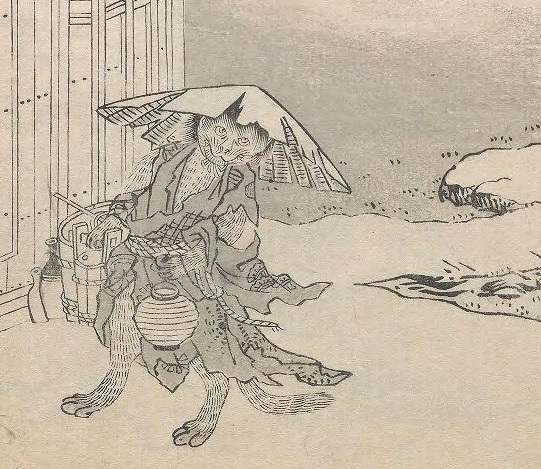 Kawauso (otter), a famed shape-shifter in Japanese folklore from Gazu Hyakki Yagyō, Volume 1, (1805 edition). When one hears “Japanese monster,” it’s easy to envision giant creatures like Godzilla. But the yokai are more down to earth, a grab-bag of all different shapes and sizes, the great-great-great granddaddies of the wild creatures that populate Japanese entertainment today. Some are typically and fiercely monstrous; others are less so, or outright funny looking or even a little pathetic. They range from humanoid to animal and plant-like creatures. Many are simply weird phenomena, or even personifications of amusing turns of phrase taken uncanny form. And more than a few are haunted housewares: all sorts of man-made tools, objects, and clothing taken on a spooky life of its own. Sekien even catalogs haunted teapots and futon coverlets in his books. 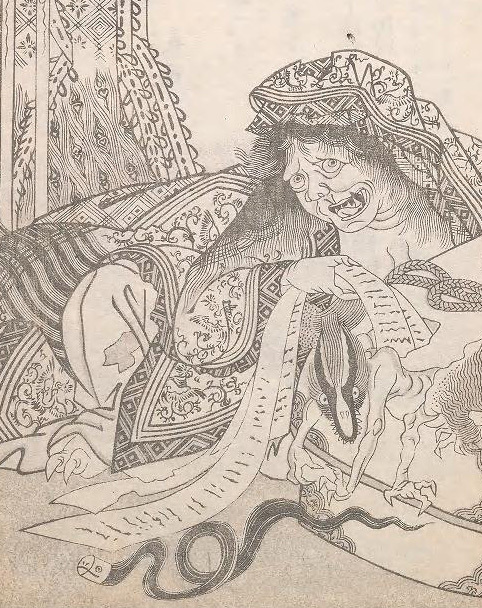 A smaller anthropomorphic yokai featured in Hyakki Tsurezure Bukuro, volume 1. (1805 edition). Monstrous though they may be, these encyclopedias are hardly the stuff of nightmares. They are whimsical entertainment from a bygone era. They overflow with linguistic wordplay, puns, poetry, and literary references of the sort that show Edoites had sophisticated and wicked senses of humor. These books are striking works of art in their own right. But most striking about them is that they prove that the concept of monsters hiding in plain sight, ala “Pokemon Go,” is nothing new in Japan — in fact it is a concept that has existed there since time immemorial. The yokai are the ancestors of the mascots and characters that populate the islands of Japan today, as charming now as they were to audiences two and a half centuries ago. 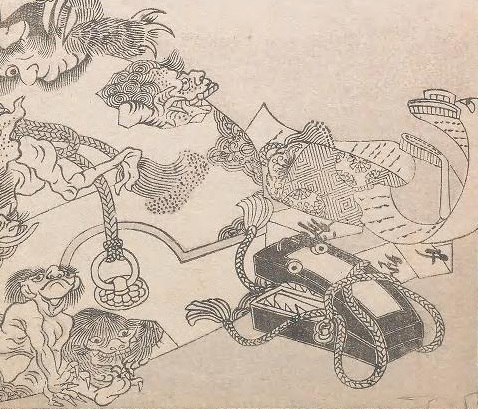 The Queen of the Book-Cart, who watches over the carts of holy texts kept by temples from Hyakki Tsurezure Bukuro, volume 1. (1805 edition). The great news for Japanese monster fans is that the world’s first English translation of Sekien’s masterwork is coming out in January of 2017. Entitled Japandemonium Illustrated: The Yokai Encyclopedias of Toriyama Sekien, it is the product of a three year effort on the part of myself and my partner Hiroko Yoda. Stay tuned for another post about it closer to the release date. In the meantime, explore the Smithsonian Libraries’ digitized copies of Sekien’s works for yourself. Who knows what monsters you might find? 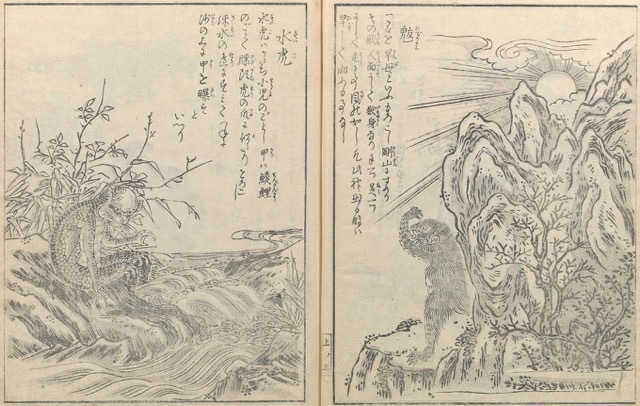 Suiko (the Water-Tiger)” and “Hideri-gami (The Drought-Bringer) from Konjaku Zoku Hyakki vol 1.